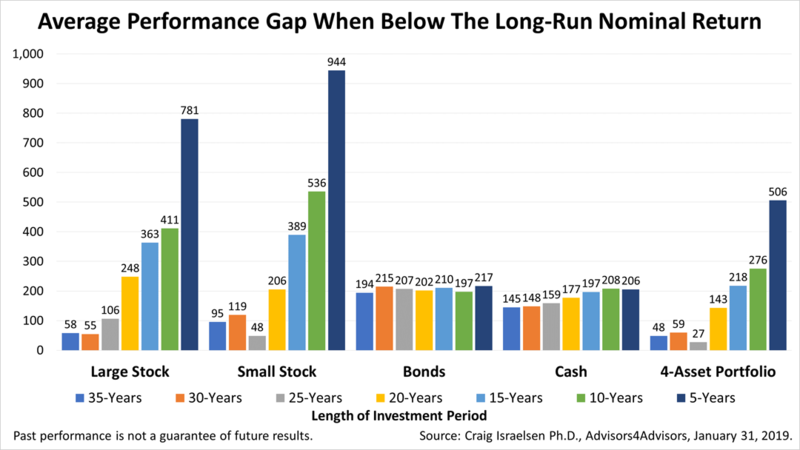 Some interesting charts to give some long term perspective of market performance of different asset classes and the blended performance of those asset classes. MY COMMENT: THIS IS A STATISTICAL TAUTOLOGY. 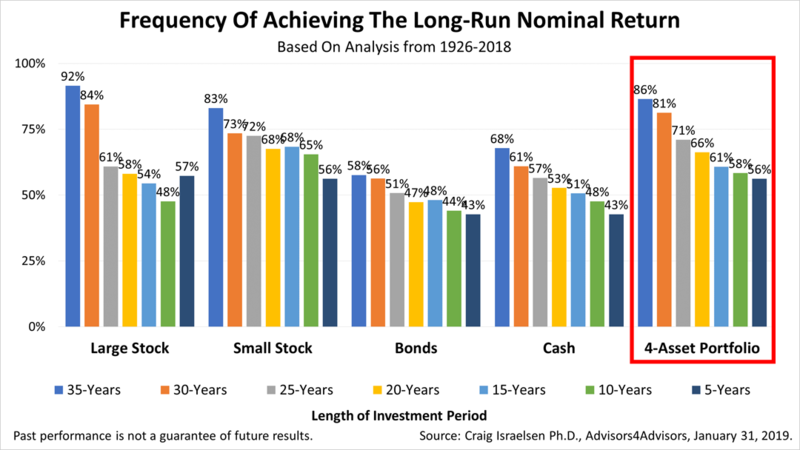 THE LONGER YOU INVEST, THE MORE LIKELY YOU EARN THE LONG TERM RETURN. Today, since almost 90% of daily US Equity trading is what we call “systematic”, we have at least $2 TRILLION in assets under management that is betting on purely quantitative strategies … and at least another $1 TRILLION behind that running “net neutral”, constantly using options and ETFs to delta-hedge portfolios in real-time. What does that do to The Machine? It makes it go faster. Especially on the most critical Factor Exposure in The Machine (price MOMENTUM)… and on the most critical duration (1 MONTH)… rules-based execution pushes prices up/down faster than ever before. Since I am a technical short term trader and focus primarily on Behavioral Finance and price action, my analysis focuses on the ROC (change in the rate of change) of expectations. A simple example would be that if investors are expecting good earnings from a company and the company acheives good earnings, I would expect the stock to be flat. It would take great earnings to move the stock up. Less than good earnings would push the stock down. I like to look for levels on any asset where I feel that the expectations are extremely positive or negative and then take the opposite side of the trade. A simple example is if a stock has extremely positive expectations, current news, projected news and analysts comments AND the stock has been moving up dramatically, then I will look to sell / short that stock on the expecatation that statisitically, the change in the rate of change of those expectations will reverse. By definition, the change in the rate of change must always move in cycles. And when everyone loves a stock already and it is widely known, how many new buyers are out there to push the stock higher? Stock prices move on the change in the rate of change of money purchasing a stock. When that change begins to roll over from very positive to less than positive, that is another indicator of a possible drop in the stock. 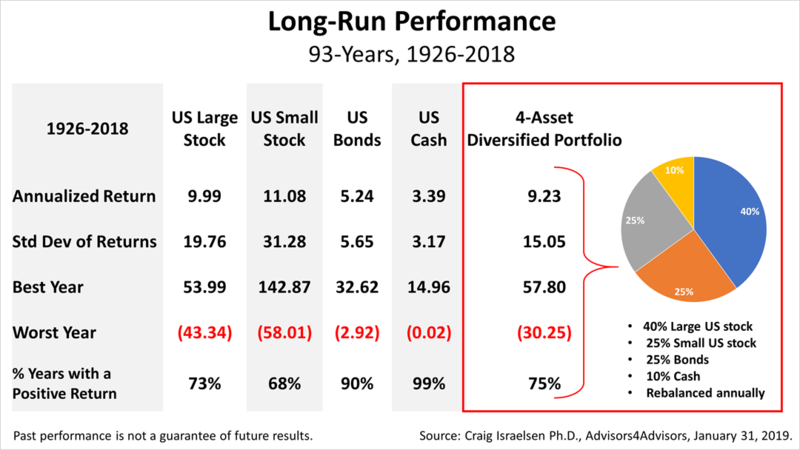 This is what I have done for the last 35+ years – with various refinements over the years based upon the lessons and losses that Mr. Market has taught / given me. What are the 3 most causal FUNDAMENTAL research FACTORS that determine the TREND’s path? The ongoing collision between developing 2019 conditions and residual 2018 peak cycle sanguinity continues to play out in conspicuous fashion. 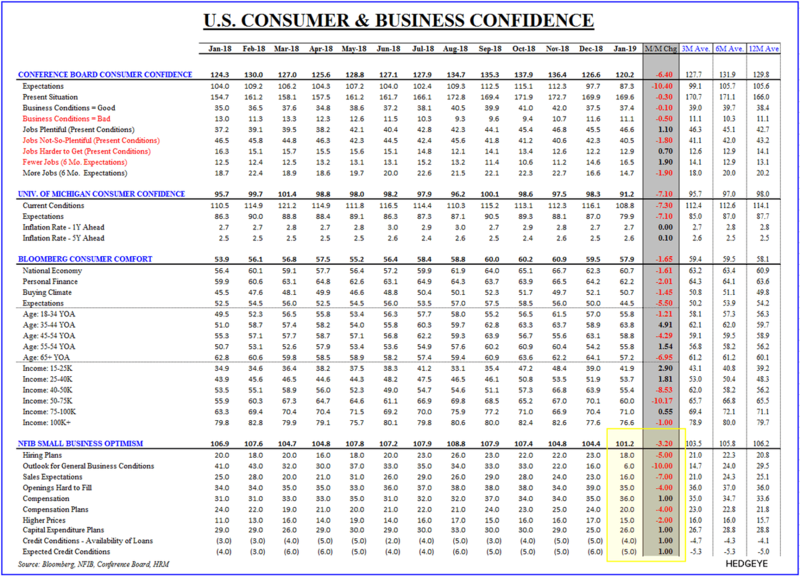 We see this across high frequency Business (& Consumer) Confidence Surveys where the prospects for slowing growth have progressively overwhelmed still solid Present Conditions. This is driving an epic capitulation in Sentiment which has now entirely retraced the ebullience associated with post-election/fiscal stimulus/record streak of accelerating growth euphoria. 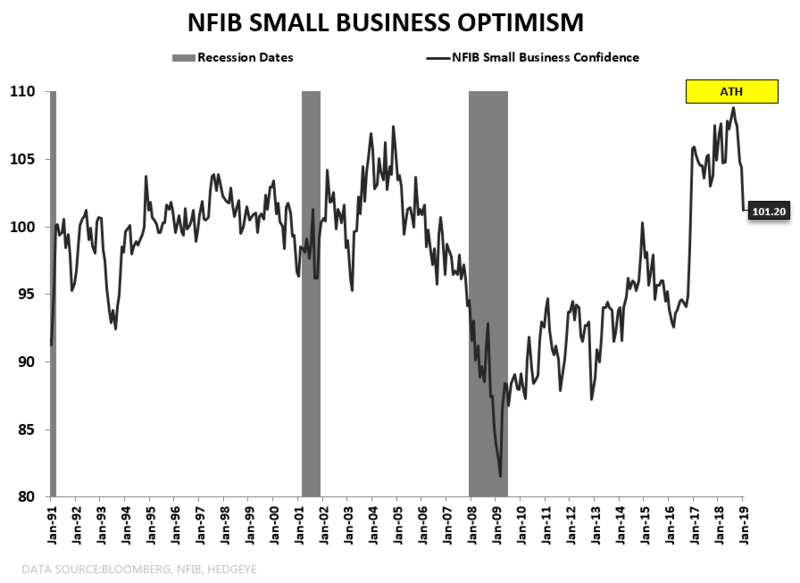 Headline Small Business Optimism fell -3.2pts, marking a 5th month of decline off the August 2018 cycle high and the lowest level since November 2016. Forward Expectations again served as the epicenter of weakness, falling -10pts sequentially on the back of December’s -6pt decline as slowing growth. 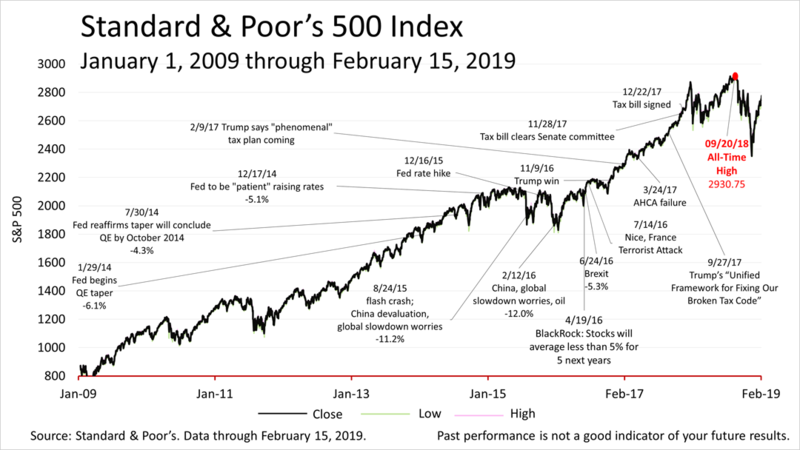 Political gridlock and asset price volatility shock conspired to drive the largest 2-month decline since the depths of the Eurozone crisis in 2012. Most notably, the juxtaposition in the 2nd & 3rd charts below provide a discrete reminder around the risks to the profit/earnings cycle we’ve been highlighting for months now. 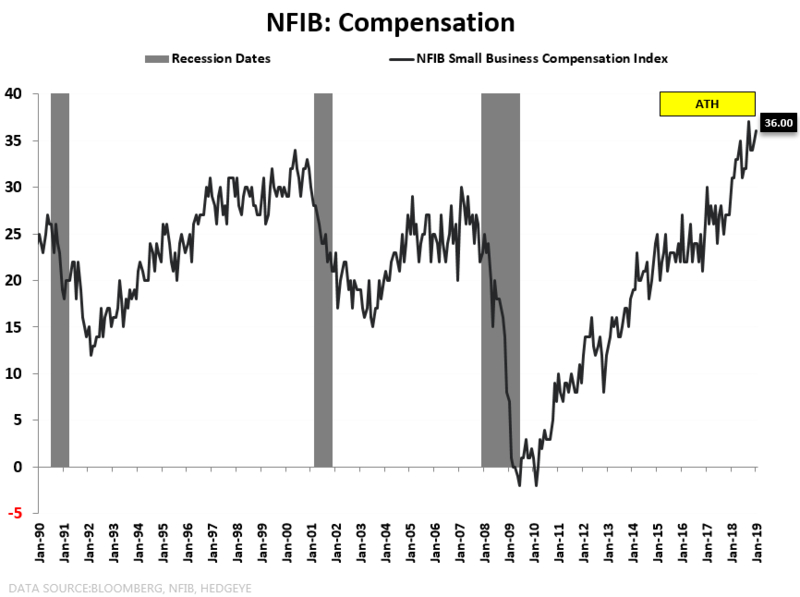 Specifically, a late-cycle acceleration in wages alongside a progressive slowing in (global and local) growth and a fading fiscal impulse into peak earnings cycle comps, higher interest rates and residual strong dollar translation effects is not margin and profitability positive. … But you already knew that. 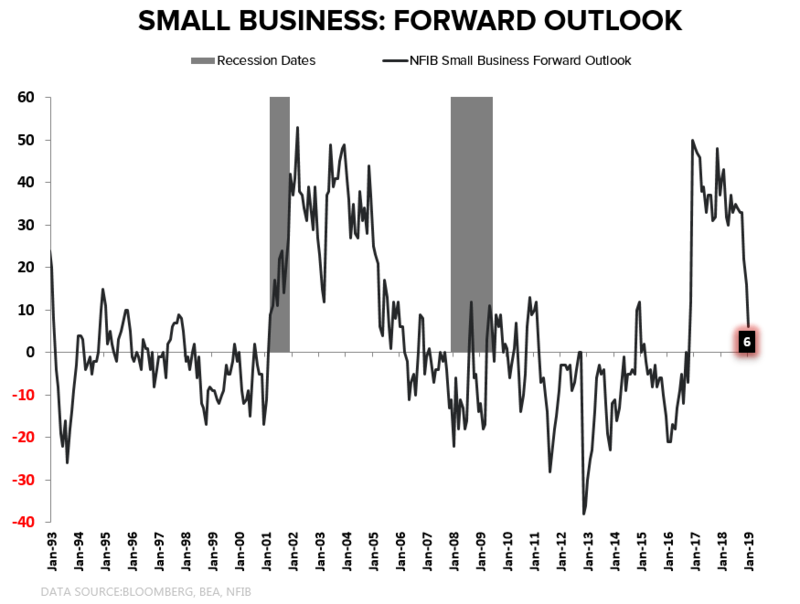 And – as we highlighted last week – with 1Q19 EPS growth estimates now negative, consensus is increasingly warming to the notion of rising earnings recession risk. Remember, its about shifts and delta’s …. You don’t need an actual recession to get paid on a growth slowing view, you just need the probability distribution to shift to more/less probable for the view to be tangibly reflected and ‘capture-able’ in market prices. Bloomberg’s Alix Steel and David Westin report on how much hedge fund titans made in 2018. Even for this Gilded Age of 0.0001 percenters, Kenneth Griffin drips money. The hedge-fund mogul recently closed on a New York penthouse for an eye-watering $240 million. Before that he picked up a $122 million London mansion. He can hang his $200 million Pollock in one and his $300 million de Kooning in the other. Remarkably, all of that cost less than what Griffin made in 2018, when his personal fortune swelled by $870 million to about $10 billion, according to the Bloomberg Billionaires Index, a ranking of the world’s 500 richest people. More remarkable is how Griffin and many other hedge fund giants mint so much money: with investment returns that are solid, but a far cry from John Paulson’s mammoth housing short or when George Soros broke the Bank of England. The Bloomberg Billionaires Index’s inaugural ranking of hedge-fund wealth lays bare a truth about the business that, for many, defines what it means to be rich. Outfits like Griffin’s Citadel and Ray Dalio’s Bridgewater Associates have grown so big by assets that they’ve effectively become printing presses for their ultra-rich owners. The largest funds can now throw off millions or billions of dollars a year in fees. Bloomberg reached out to representatives for all of the firms and individuals on the list. All declined to comment. The top hedge-fund earners of 2018 performed significantly better than the average manager. Citadel’s flagship Wellington fund, for instance, returned 9.1 percent last year, while the average fund lost 6.7 percent, slightly worse than the S&P 500 Index. Of course, Griffin doesn’t get performance fees unless he makes a profit for his clients. As the largest investor in the funds, the billionaire’s interests are aligned with theirs. How did other big names stack up in 2018? Quants feature heavily on Bloomberg’s list, led by James Simons of Renaissance Technologies. The former code-breaker’s fortune increased $1.6 billion to $16.6 billion, according to Bloomberg estimates, making him the world’s wealthiest hedge fund manager. RenTech’s Institutional Equities Fund gained 8.5 percent, while its Medallion vehicle, closed to outside investors, did better. Ray Dalio’s fortune rose $1.3 billion, powered by Bridgewater’s approximately $160 billion of assets. He’s now worth about $16.2 billion. His flagship Pure Alpha fund gained 14.6 percent last year, while the All Weather strategy lost money. Some managers crushed the competition. Michael Platt of Bluecrest Capital Management returned 25 percent, although hedge fund investors didn’t benefit after he kicked out clients. Jeffrey Talpins of Element Capital Management had a 17 percent gain for his macro fund, elevating him to billionairedom. For several people on the list, hedge funds are just a component of their businesses. Griffin owns one of the world’s largest firms making markets in stocks and bonds. In addition to buying houses and art, he’s given away more than $700 million to charity. Chase Coleman of Tiger Global Management runs a fabulously successful venture capital arm, helping to boost his fortune to $3.9 billion. The figures are more than almost anyone will earn in a lifetime, but 2018 wasn’t a particularly good year for the industry. Closures outnumbered launches in 2018 for the third year in a row, according to Eurekahedge, and investors continue to pressure managers to cut their fees. This year is shaping up to be an improvement over 2018. The average fund returned 2.1 percent in January, according to the Hedge Fund Research index. Citadel’s Griffin is again beating peers with its Wellington fund advancing 3.6 percent last month. Element, now managing $18 billion, saw a 3.5 percent jump in its main fund. To compile the ranking, Bloomberg broke out “total income” figures to show estimates of dividend income and return on personal assets. Dividend income is our calculation of the share of performance fees that the manager takes home as owner of the hedge fund. Return on personal assets is our estimate of how much managers earned on their own cash invested in their funds. Judd, here is your Midday Missive. Spu’s back above 2745.50 will attract buyers. NFLX looks good against today’s low. Sold 2700s and 2695s puts for Friday near the opening on the pullback. Now selling the 2765s calls… Liking the idea of strangles and legging into them by selling puts on drops and calls on rallies. Ended up losing about 6 points overall on the Wed expiration short calls. Not too terrible considering the 50+ point push in 2 days. As laid out earlier this week- I do think the SPX/MKT is coming into a pivotal High/Top- sometime this week, the question today IS… was yesterday’s High ,IT? So, without trying to get too cute- I think the MKT has a good chance of holding in here this am and probably rally’s UP into tomorrow if I had to take an educated technical guess based upon the sum of the parts. The trend is still intact and unless we take out 2717,(which is probably NOT going to happen today), then we must assume the current trend is valid. We will get there, and I think well know it when we DO… *TIME, price and Algorithmically we will align and fire! Last week we mentioned the SPX/MKT was likely to hold in well, and move higher based upon relatively robust DMP algo readings we were seeing.